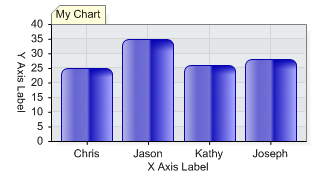 This tutorial describes how database queries can be used to populate chart series and elements. 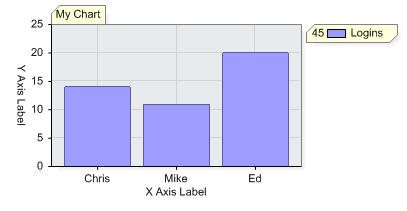 By default, the first column returned by your query is mapped on the x axis and the second column is mapped onto the y axis. Returning a third column splits the data into series. This feature is referred to as 'SplitBy'. Another characteristic of the splitBy functionality is the aggregation of grouped values. For this example consider a database table with 3 fields [ Date, Items_Sold, Sales_Rep ] . Each day an entry is added with the number of items sold for each sales rep. In our database there are two and they have been selling from January - May. 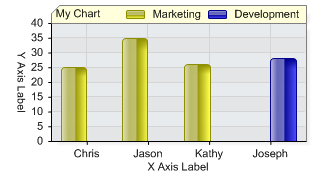 In this case the sales of each representative are aggregated for each month. * This sample also uses the dategrouping setting of (TimeInterval.Month), see dataEngine for more info. Figure 3. Multiple series with date grouping. Count occurrences of a fields value. This will create a table with a name and a value (1) for each login. This method takes advantage of the DataEngine's aggregation feature and the second column will be summed.